On Sanford and Son, Fred Sanford is watching too much television. His family thinks he’s addicted. They call in the hypnotist to cure him of his addiction. 1) Hypnosis is not done with a watch. 2) In hypnosis the person is not “under” the spell of the hypno -therapist. 3) The post hypnotic suggestion, Fred will become warm every time television if mentioned, IS quite successful. Hypnosis is a powerful tool that can produce all kinds of changes. It can help with sleep,anxiety, sexual functioning, as well as many other issues. If you are interested in experiencing how hypnosis works, attend one of my upcoming hypnosis workshops. They will occur on February 3rd from 1:30-2:30PM and March 3rd from 1:30-2:30PM. Center of Attention: The Unreal Life of Derek Sanderson follows Sanderson as he wins two Stanley Cups alongside his friend and teammate Bobby Orr, becomes a nightclub owner and coast-to-coast celebrity, widely known as “The Joe Namath of Hockey,” and signs what was then the richest contract in the history of pro sports, only to lose it all in a haze of booze and drugs. Sanderson’s addictions almost killed him – but that wasn’t the end of his story. He would emerge from the darkness to undertake a comeback few believed possible. You found the courage to end your last relationship. Maybe the relationship ended amicably. Maybe it had a dramatic and painful ending, perhaps in divorce. Either way you are finished with the relationship and are looking to begin to date. You may have some fear and apprehension about getting back in the dating game. To find the right person you need a plan. Here are some dos and don’ts for your plan to finding your next partner. Ending relationships are hard. It is normal to have feelings of grief and sadness as well as anger and fear. Give yourself the time to heal and process these feelings. If you need additional support, find a good therapist who can help you with loss as well as to look for possible patterns in your relationships. Most of us don’t make a major purchase impulsively. We research, talk to others, and identify what our needs are. Why wouldn’t you do that for your next partner? Identify what you want in a relationship and don’t settle for someone who doesn’t meet your needs. You started dating again but there is something about this person that bothers you. Pay attention to it. The old adage, “If it doesn’t feel right, it probably isn’t right,” is true with people as well. There is no reason to keep your date a secret from family and friends. Let everyone meet him/her. They will have opinions and insights to share. It’s more data to work with in order to make your decision. If you are paying attention to your relationship history, you know what types of people you are attracted to. You also know which people didn’t work out the first time. It probably won’t work the second, third or fourth time either! Just because Mary from bookkeeping is single or Bob from shipping is available doesn’t mean that you should date them. Be clear about who you want to be with and stay with that plan. No one has ever died from being lonely. It feels crappy but probably won’t cause death. You know what flags are: they are the comments that are made, the illogical behaviors that occur, the stories that you question. Communicate about them. Pay attention to them. Don’t excuse them because you really like the person. Everyone thinks they know everything about relationships. They are more than happy to share their beliefs, opinions, feelings about who would be best for you. You have an idea about who your ideal partner is — listen to yourself. If you are dating someone and there is regular conflict, major areas of disagreement, or addiction/mental health issues, these will not improve by themselves. The relationship will continue to be affected by these issues — they won’t go away. Love will not make them better; only the other person can make them better. In order to pick your next partner, you need to look inward. You need to pick “the best athlete available” — the one that fits your needs! It’s ok to be afraid and apprehensive. Collect data from both your heart and your head. Don’t be afraid to eliminate people from your search. Pay attention to the “flags”, listen to yourself. You will know when you have found the right person. Recently, the Rock and Roll Hall of Fame inducted Peter Gabriel. As the front man for the band Genesis, Gabriel’s elaborate costumes got the band noticed. His unique singing and writing led to the band’s success. In 1986, Gabriel left Genesis and released the album So which sold five million copies. His next album Us was released six years later. On that album you will find the song Digging in the Dirt. According to Gabriel,Digging in the Dirt is a song about his therapy. There are many interpretations about the song. These include domestic violence, murder and many others. (you can find more of those here.) Since there are no factual interpretations, please indulge my therapeutic perception . Gabriel’s inner shame and self loathing have taken over. He is worthless, afraid, and ashamed. The phrase “stay with me I need support” is a request to the therapist to be with him on this journey of “finding the places I got hurt”. He knows that he is in a trusting therapeutic relationship because he not only wants to find those places, he wants to “open up the places I got hurt”. He knows there’s a bunch of issues that he has to find. He gets overwhelmed as he starts to uncover the pain. This song is a great example of the therapeutic process. The chorus is so appropriate for many people that I have seen over the years. Like Gabriel’s experience, therapy is scary. It’s full of fear, pain, shame and guilt. People keep looking and finding. They keep asking “why” sometimes without answers. Sometimes they find answers that they don’t like. Sometimes people become aware that they need to take action and those actions are overwhelming and scary. Sometimes there are no answers, only questions. Sometimes, my best and only contribution, is my understanding of the pain, sadness, and loss that my client is feeling. I’ve seen many clients over the years go through storms in order to find their rainbow (If you’d like to read more on this topic, go to one of my old blogs “You can’t have a rainbow without a storm”). I enjoy the experience of seeing people make changes in their lives. As we “dig in the dirt”, we get to plant seeds and crops that grow year after year. They are fruitful, they are plentiful, and they are healthy. Don’t be afraid to dig–Change is Possible! In 2009 he was suspended 50 games for violating baseball’s drug policy by taking human chorionic gonadotropin (hCG), a women’s fertility drug.According to steroid dealer Victor Conte, hCG is often used to restart natural testosterone production after a steroid cycle.In the spring of 2011, Ramirez was informed by MLB of another violation to its drug policy, which could result in a 100-game suspension. He chose to retire on April 8 rather than face a 100-game suspension. You would expect nothing different from Manny since he was a person who played by his own rules. Although an exciting and charismatic player, Manny was always being Manny. The obvious answers to our quiz is “D” in all of these situations. The thing we learn from all of this is that Manny Ramirez, Paul Maxwell, Jenny Malone and Bobby Duncun are starring as themselves– They do what they do in ALL situations. Manny is just being Manny, Paul is just being Paul, Jenny is just being Jenny, and Bobby is being Bobby. 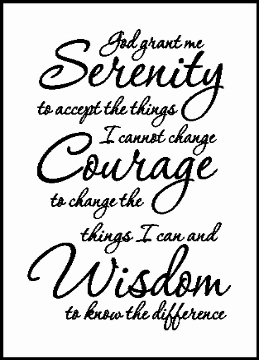 If we ACCEPT what we cannot change, which are all other people’s behavior, and change the things we can, which is our reactions to them, then we can have serenity. 3 sentences can give us all the change we need. Use them regularly and you will feel better. When I say “thank you” I mean it as it is intended. Thank you for helping me. We probably don’t say it enough. We don’t acknowledge those people who do the simple mundane tasks or even those who go out of their way to do more. For whatever reason, we have decided that thanking people isn’t all that important. We move on to the next thing that we are doing. For those who still have these words in their vocabulary, thank you for using them! It’s good that we take the time to thank people. However, there are some people that we would never thank. These are people that we feel hurt, resentment and pain towards. These feelings are the venom that pervades our souls with blackness. We are much more likely to use some other two word greeting than the kind and gentle “thank you”. But what if I said “thank you” to this resented person? What if the “thank you” could actually help ME? If we have venom towards an ex-partner, family member, boss etc, these feelings follow us everywhere. They invade our day, our night, and our sleep. We constantly bombard ourselves with these intense feelings. We can’t stop thinking about the damage that has been caused. In the worst of circumstances, we are engulfed when thinking about the upcoming family gathering, work meeting, sporting event. There is no way that we could possibly be in the same room as that person, let alone in close proximity. By constantly obsessing about this person, we are giving him/her tons of power. This person is “taking up rent free space in our heads”. We can do something different to make it better for us. Doing something different implies taking a risk. The risk involves thanking the person for their help. For example, I have to ask my ex-partner to pick up the kids from swimming class. My automatic thoughts might be “I have to ask this person to do this; s/he should know the schedule and should be volunteering to help. I mean after all s/he did to me…..etc”. My healing and empowering new thoughts can be “I’ll ask him/her to pick up the kids”. When the ex-partner fulfills the request, all I have to do is say “thank you”. I don’t have to rant, rave, harangue, tell everybody about what a jerk -off my person is. All that is necessary is a thank you. Have you seen these posts on your social media? Did you recognize some of those posts as yours? Have you asked yourself why we need to tell people where we are, and what we are doing? If celebrities posted like we do about where they are , this would be exciting– Scarlett Johansson is at the dry cleaners.- drop off or pick up?. Tom Hanks is at Cluck U Chicken—wondering what he ordered? Bill Wilson just went to the Denville AA meeting(I’d pay to see that since he died in 1971). I haven’t seen TMZ follow me to the dry cleaners—(shirts, pants an occasional sport jacket if you really wanted to know). It seems that the social media phenomenon is creating a group of people who want to be the next reality stars– the next Duck Dynasty, the next Kardashians or worse the next Ice Road Truckers, or Moonshiners? These reality “stars” tells us that anybody can get on a television show in spite of how little talent they have. The dumbing and numbing of society! We’ve even lowered our standards of fame—it used to be 15 minutes, now 15 seconds will suffice! 140 characters of twitter gold and the entire universe can know your immediate thoughts on ARod, the NSA, Snow, the NFL or Obamacare. But do we really care? And what’s the impact of all of this connection on our real interpersonal connections. If I’m wired to the universe do I miss out on right here right now, in the moment, living? It’s amazing to me that we are creating a society of non-interpersonal communicators who are happy to tell us about all of their low intimacy behaviors. If we do not have personal, intimate conversations with others, then we lack depth as people. It’s a new year and time to make some changes happen, so the next time you want to tweet or Facebook or text someone, how about using some old school technology—TALK.